Sgt. 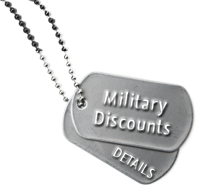 Clutch salutes our Armed Forces by offering a 15% Military Discount Coupon valid on Auto Repair, AC, Brakes, Clutch, Differential, Radiator, Transmission, Transfer Case, Tune Ups and more. We do our very best each and every day to keep our customers satisfied and safe on the road. We offer a full range of Auto Repair Services and Drive Train Repair Services at Affordable Prices. Valid up to $175.00 on Qualifying Repair Service. Not valid with other Discounts or Coupons. Proof of current Active or Retired Military ID required. Print & present coupon at time of purchase.